US-based blind Chinese activist, Chen Guangcheng, has urged the new leader of China's Communist Party to institute reforms and uphold human rights. In a video posted online, Mr Chen said that Xi Jinping could "carry out reform" or maintain the Party's power. The appeal comes after a Chinese court sentenced Mr Chen's nephew to three years in jail for assaulting officials. Mr Chen escaped house arrest earlier this year and then took refuge at the US embassy in Beijing. His escape caused a diplomatic crisis and was defused after weeks of uncertainty when Mr Chen was allowed to travel to the US for studies. After he fled, his relatives' homes were raided and his nephew, Chen Kegui, was detained by police after a scuffle. The nine-minute video was released on Sunday by US-based non-profit organisation ChinaAid to mark World Human Rights Day. In the video, Mr Chen said that officials "have enacted revenge" on his nephew and others because he fled the country, and that those who ordered his nephew's arrest have been promoted. He addresses the newly-elected head of the Communist Party, Xi Jinping, who was confirmed during the ruling party's once-in-a-decade leadership change last month. "Dear Mr Xi Jinping, the whole nation is watching you. Whether you will follow the call of heaven and people to carry out reform, or kidnap the government and maintain the power of the Communist Party, it is a matter of whether China will have the transition in a peaceful way or a violent way," Mr Chen said. In the video, he also cited examples of political changes happening in other countries like Burma. "If Thein Sein can do it, yet Xi Jinping doesn't, obviously it's not that Xi couldn't do it, but simply that he wouldn't. And that will speak volumes to who he is as a person and as a leader," he said. 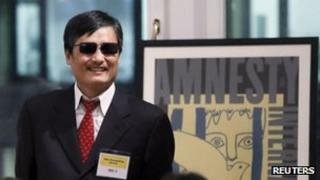 Chen Guangcheng, a self-taught lawyer, has campaigned against forced abortions under China's one-child policy and was jailed for four years in 2006 for disrupting traffic and damaging property. He was placed under house arrest after his release in 2010. He is currently in the US, with his wife and two children, studying at the New York University School of Law. In August, after meetings in the US Congress, the activist urged Washington to investigate his case and protect his family at home in China's Shandong province.